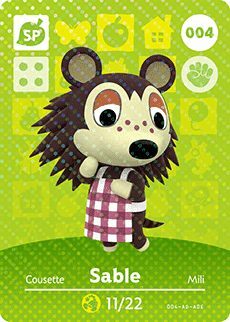 Sable is one of the Able Sisters, who run a cheerful clothing shop on Main Street in Animal Crossing: New Leaf. She looks after the knitting, unlocking the QR code machine if players take the time to speak with her each day. Her birthday falls on November 22nd, meaning that her star sign is Scorpio.